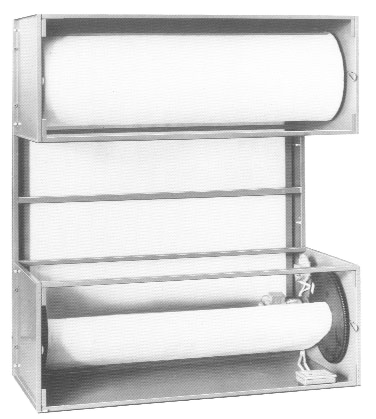 The AES Environmental Filtoroll units are designed for use in limited operating period or low occupancy establishments. In the Filtoroll unit the media drive motor is a 62 watt integral gear motor directly coupled by chain and/or gear drives to the dirty media spool. The in-built pressure differential switch ensures a constant resistance and therefore a constant airflow despite particulate build-up. The edges of the media are securely located in edge sealing channels of generous depth to prevent any leakage of air around the edges of the media. The AES Environmental Filtoroll units are designed for use in limited operating period or low occupancy establishments such as small offices, clubs, hotels, shops and function rooms. The normal operating resistance of a Flitroll unit is 100 Pa at rated capacity. Unit are available in size from 2473 L/s up to 73,000 L/s capacity. ASHRAE tests give an efficiency of 83% at rated airflow. AES Environmental provides full air filter maintenance, media changeover, replacement parts and servicing facilities. Under typical conditions, the roll media is changed every 6 – 24 months, depending on filter height and air contamination levels.